On Saturday two college teams faced off. But they weren’t just any college teams. This was the Army-Navy game. The Commander-in-Chief’s Trophy was at stake. But it wasn’t the win or the trophy that garnered the most attention. It was the Army-Navy’s salute to the National Anthem.They put the NFL players to shame. The U.S. Military Academy and U.S. Naval Academy met for their annual gridiron classic on Saturday in the aptly named “Army-Navy Game.” While eyes are normally fixated on the athletes and their performance, the 118th meeting between the two military academies saw attention turn to the national anthem ceremony that took place before the opening kickoff. Amid an angelic snowfall at Philadelphia’s Lincoln Financial Field, the choirs of each academy joined in singing “The Star Spangled Banner,” The Daily Caller reported. As the choirs sang in unison, not one player for Army or Navy sat or knelt, a stark contrast to the behaviors being displayed in the NFL. Many on Twitter praised the magnificent performance, while some used the moment to call-out NFL players who have chosen to kneel or sit during the national anthem ceremony to protest perceived injustice against black Americans. I have to admit I thought of the kneeling NFL players when our National Anthem was played at the Army Navy game yesterday. The pride I have in my heart for our soldiers, sailors, marines and airmen who live this anthem daily, some will never feel. The kneelers are missing out. Watching the National Anthem at the Army/Navy game and not one person is kneeling. Maybe those idiots in the NFL are watching. 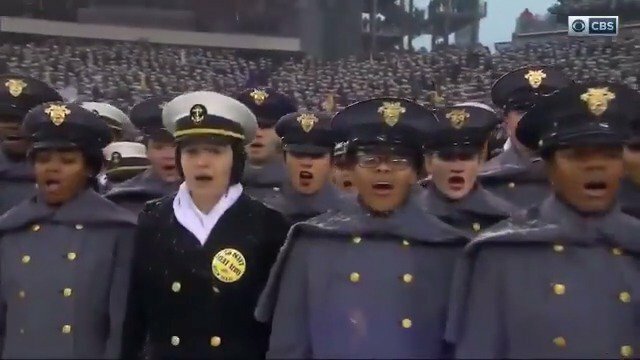 Watch this performance of the National anthem at the Army vs Navy football game today. Not a single knee being taken!! This is a group of young men and women who love their country, unlike those NFL ingrates. Sen. Ted Cruz, R-Tex., also expressed his gratitude for the display in a Tweet. “This is how it’s done! The National Anthem at yesterday’s Army-Navy Game will give you chills,” Cruz wrote Sunday. Florida Gov. Rick Scott, a veteran of the U.S. Navy, also joined in praising the performance put on by both academies. The falling snow and frigid temperatures couldn’t freeze out their love for America. Despite a strong Navy drive, marred by a few penalties, to end the game, the Midshipmen fell short—or, more precisely, wide left. Kicker Bennett Moehring missed a 48-yard field goal with time expiring in the snow that preserved a 14-13 victory for the Black Knights (Army). The win gives West Point their second straight in the series after dropping 14 in a row. But Navy owns the edge overall with a 60-51-7 record. The victory was extra special for Army, as they secured their rights to the Commander-in-Chief’s trophy. “The Army-Navy game truly is America’s Game, and CBS has done a tremendous job telling the stories of our cadets and midshipmen from coast-to-coast,” said United States Military Academy athletics director Boo Corrigan. Following each game, players sing both teams’ alma maters. The winning team joins the losing team and sings facing the losing team’s students. Then the losing team joins the victors on their side of the field and sings the winner’s alma mater to its students. This act is a show of mutual respect and solidarity. To all soldiers in the Army and Navy – we salute you for being on the real field – the battlefield, protecting our nation and serving our country. Thank you! The NFL players could learn a lot about pride and patriotism from you, especially when it comes to honoring the nation’s national anthem! Democrat Alcee Hastings to Resign Next? Taxpayers Paid $220,000 to Hide Sexual Abuse!